"This recipe goes way back; I grew up loving these bars. I entered this in the Jefferson County Fair on August 28, 2010. It won First Place." Place 1/2 cup of brown sugar into a saucepan along with the dates and apricots; pour in the apricot nectar. Bring to a simmer over medium heat, and cook, stirring constantly, until the nectar has mostly evaporated and the mixture is sticky, about 5 minutes. Set aside to cool. Preheat an oven to 350 degrees F (175 degrees C). Whisk together the flour, baking soda, and salt in a bowl; set aside. Grease a baking sheet. Stir the melted shortening and vanilla extract into 1 cup of brown sugar in a large bowl until no lumps remain. Stir in the flour mixture and oats; work well with your hands until the mixture is evenly combined. Press half of the oat mixture onto the prepared baking sheet. Spread the cooled apricot mixture evenly over the oats, then press the remaining oat mixture evenly over top. Bake in the preheated oven until the top is golden brown, about 30 minutes. Cool completely before cutting into bars and serving. 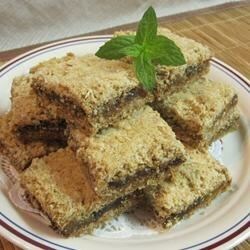 Sweet, tangy and crunchy good bars! When cutting the dates and apricots into small pieces make sure they are about the same size. They will cook more evenly.